Northern Ireland's Gareth McAuley (right) celebrates with his team mates after scoring his side's second goal. 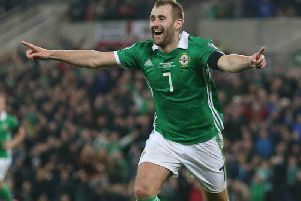 Northern Ireland thrashed Azerbaijan 4-0 at Windsor Park on Friday night to take control in the race for second place in their World Cup qualifying group. Goals from Kyle Lafferty, Gareth McAuley and Conor McLaughlin were cemented by a late effort credited to Chris Brunt, though Steven Davis may have got the decisive touch, as Michael O’Neill’s men moved above the previously unbeaten Azeris and into second in Group C after four fixtures. Here, News Letter Sport breaks down what emerged from a wet and wild night at Windsor. Whether Brunt should be awarded a first international goal in seven years remains unclear, though captain Davis was only too happy for him to claim the honour after a fine return in a green shirt. It had been 13 months since Brunt last appeared for Northern Ireland, with a serious knee injury sidelining him at Euro 2016, and he certainly made up for lost time. He had to overcome sustaining a head injury in the earlier stages but the delivery from a free-kick for McAuley’s goal prior to the break was vintage Brunt. Brunt’s comeback also helped strengthen the Northern Irish at dead-ball scenarios and it was via such methods where Azerbaijan were undone on three occasions. The opening goal came from a long Josh Magennis throw before Brunt’s free-kick was turned in by McAuley and Oliver Norwood’s second-half corner was nodded home by McLaughlin. Such opportunities were a source of multiple goals in the qualification campaign for France and are already proving critical again on the route to Russia. Such is Northern Ireland’s impressive record in Belfast, their Windsor Park home has been completely redeveloped since they last lost there. That was a 4-2 reverse to Portugal in 2013, a night often cited as a turning point for the likes of Lafferty and others, and this victory was their second straight 4-0 success after last month’s hammering of San Marino. O’Neill’s outfit are now unbeaten in their most recent 10 home games, winning eight of them and scoring 21 while conceding just three times. The Green and White Army cheekily suggested their countrymen would end up finishing top of the group come its conclusion, some statement given holders Germany’s march to Russia included an 8-0 annihilation of San Marino on Friday. The best O’Neill’s team can hope for is a runners-up berth and a likely play-off tie as a result. Norway, the Czech Republic and Azerbaijan would all have harboured belief they could finish in that spot too, but four games in O’Neill’s team hold all the cards. O’Neill made three changes and one of those saw right-back McLaughlin restored despite Lee Hodson’s impressive performance in that role in Germany last month. The Fleetwood defender responded with a terrific display, forging a fine partnership down the right with converted winger Josh Magennis, and he capped the night off with his maiden international goal midway through the second period. Fleetwood can consider themselves fortunate a player of such quality remains in the third tier of English football, while those above them in the ladder should be considering a January swoop.